Photo by Mike Wertman – New Medina cross-country teams Coach Christian Held meets here with several veteran members of the Mustangs squads. In front are Arian Cayea, Isaac Pace and August Pietrafesa. In back are Cora Payne, Rebecca Lunden, Hannah Heil and Corinne Hill. Missing from the photo are Trenton Cruz and Sabrina Quiros. 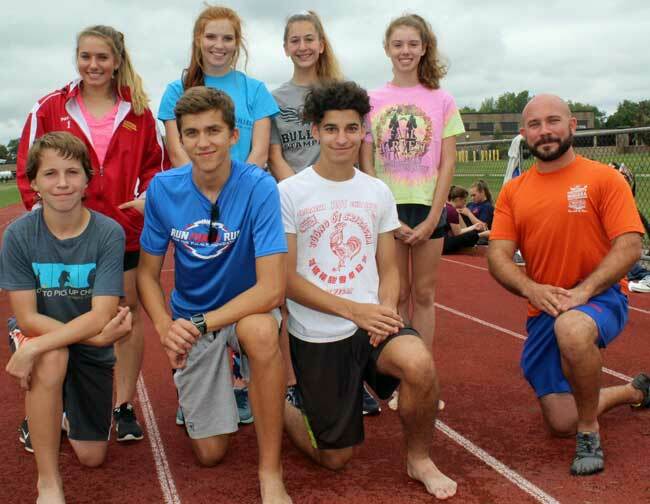 Bolstered by a larger turnout of some 20 runners, and with new Coach Christian Held at the helm, the Medina High boys and girls cross-country teams are prepping for the September 25 Niagara-Orleans League opener at Wilson. The Mustangs boys squad is anchored by the veteran quartet of junior Trenton Cruz, sophomores August Pietrafesa and freshman Isaac Pace and Arian Cayea. Also promising are sophomores Alwyn Cayea, Aedan Bunch and Cameron Castanon. The girls team is led by the veteran quintet of seniors Rebecca Lunden and Cora Payne, juniors Hannah Heil and Sabrina Quiros and sophomore Corinne Hill. Last year the boys squad went 3-3 and the girls 0-6.